Long-term observations of surface temperatures show an intensified surface warming in Canada, Siberia, Alaska and in the Arctic Ocean relative to global mean temperature rise. 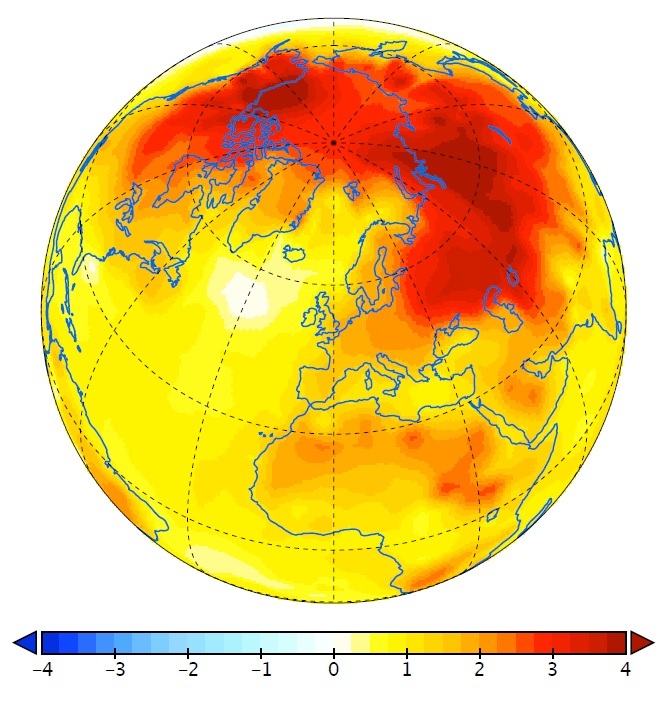 This warming pattern, commonly referred to as Arctic amplification, is consistent with computer models, simulating the response to increasing greenhouse gas concentrations. However, the underlying physical processes for the intensified warming still remain elusive. ▲ Figure 1: Amplification factor of observed surface temperatures relative to the global mean surface temperature (from 1951-2017). The observations show a clear enhancement of warming In the Arctic region and across Siberia, Northern Canada and Alaska. "Our study clearly shows that local carbon dioxide forcing and polar feedbacks are most effective in Arctic amplification compared to other processes", said corresponding author Malte Stuecker, project leader at the IBS Center for Climate Physics (ICCP) in Busan, South Korea. In the tropics – fueled by high temperature and moisture – air can easily move up to high altitudes, meaning the atmosphere is unstable. In contrast, the Arctic atmosphere is much more stable with respect to vertical air movement. This condition enhances the CO2-induced warming in the Arctic near the surface. In the tropics – due to the unstable atmosphere – CO2 mostly warms the upper atmosphere and energy is easily lost to space. This is opposite to what happens in the Arctic: Less outgoing infrared radiation escapes the atmosphere, which further amplifies the surface-trapped warming. The new findings of this study highlight the importance of Arctic processes in controlling the pace at which sea-ice will retreat in the Arctic Ocean. The results are also important to understand how sensitive polar ecosystems, Arctic permafrost and the Greenland ice-sheet will respond to Global Warming. M.F.S. was supported by the Institute for Basic Science (project code IBS- R028-D1) and the NOAA Climate and Global Change Postdoctoral Fellowship Program, administered by UCAR’s Cooperative Programs for the Advancement of Earth System Sciences (CPAESS). C.M.B. was supported by NOAA grant CPO NA115OAR4310161. C.P. was supported by a JISAO postdoctoral fellowship. K.C.A and Y.D. were supported by NSF grants AGS-1752796 and OCE-1523641. S.M.K. and D.K. were supported by Basic Science Research Program through the National Research Foundation of Korea (NRF) funded by the Ministry of Science, ICT and Future Planning (2016R1A1A3A04005520). S.M. was supported by the Australian Research Council (ARC; grant numbers FT160100162 and CE170100023). F.F.J. was supported by NSF grant AGS-1813611 and Department of Energy grant DE-SC0005110. Computing resources were provided by University of Southern California’s Center for High-Performance Computing. Malte Stuecker, IBS Center for Climate Physics (ICC), Busan, South Korea; email: stuecker@pusan.ac.kr; phone: +82-51-510-7862. Kyungmi Park, IBS Center for Climate Physics (ICC), Busan, South Korea; email: kyungmi@pusan.ac.kr; phone: +82-51-510-7750.